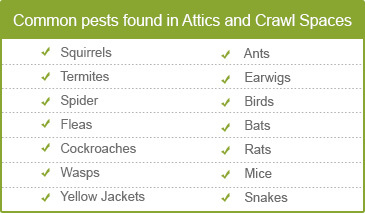 Do you know the true condition of your attic and crawl space? A poorly maintained attic can cause serious trouble. Here’s why – dark, dingy and damp places provide the ideal conditions for a wide range of issues, which can go unnoticed for years before showing any signs of damage. A regular inspection can detect potential problems such as leaks, infestations, fungi or condensation before they escalate and become a major headache. Also, it might save you thousands of dollars in damage repair. Quartz Solutions is the perfect answer. Armed with the latest technology, our expert team will undertake the maintenance and improvement of your attic & crawl spaces and eliminate the problem at its source. The potential dangers of an unattended attic and crawl space are real. Apart from draining your finances in carrying out costly repair of structural damage, it can ruin the foundation of your property and endanger your, and your loved ones, health. High moisture and humidity levels often found in these spaces, which encourages mold or mildew growth, and can impact your living space. People with weak immunity system may experience severe reactions when exposed to mold. Rodent or birds can damage insulation, electrical wires and travel in air vents. This can spark an airborne disease. Wasps, roaches and termite activity can trigger serious infections and destroy your dwelling. Leaks in duct and plumbing components are a certain cause for hikes in your monthly electricity bill. 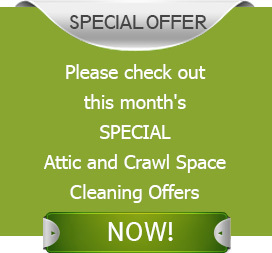 A well-maintained attic &crawl space ensures a hygienic and healthy living environment. If you are hesitant to enter the confined spaces, hire the services of Quartz Solutions. Our skilled team will show up at your door to evaluate your property for potential hazards and toxic gases without charging a penny. They will also give advice on cleaning solutions to get your home back in shape at affordable rates. We pride ourselves for carrying out high quality jobs time after time, in a professional manner with no surprises, while offering some of the most competitive prices in the market. Madison in Morris County, NJ, is a quiet and charming downtown with strong family values. The borough nicknamed the Rose City boasts of a close-knit community that takes pride in their beautiful colonial homes. We at Quartz Solutions want to do our part to help residents maintain their attic and crawl space. When we are done cleaning-up, our clients get to enjoy the peace-of-mind of knowing that their attic and crawl space is at tip-top shape. Don’t risk your well-being and schedule a free inspection right away by calling us at 973-536-1013. 100% free with no obligations. Thanks for doing a superb job! Josh and his team spent two days removing and installing upgraded insulation, spraying and sanitizing. The whole process was extremely professional from initial consultation and estimate to completion. Great service! Great Company! Dealing with Quartz Solutions was hassle free and convenient!